Young People Playing with Risk: Social networking and the normalization of gambling behaviors – In a virtual work, social networking websites are increasing advertising gambling like games to youth through using well known characters and flashy images. These types of games could influences how youth normalize gambling as they grow up. Gambling Boys: CBC Passionate Eye Documentary. Through interviews with individual youth, this documentary illustrates how ease of access to online gambling and sports betting facilitates harmful involvement. The International Centre for Youth Gambling Problems and High Risk Behaviors conducts research and provides treatment for youth who experience gambling-related harm. The Addictions Foundation of Manitoba offers helpful information for youth and parents, surrounding how gambling works and the psychology behind it. Youth Bet is a highly interactive website that is designed by youth for youth. 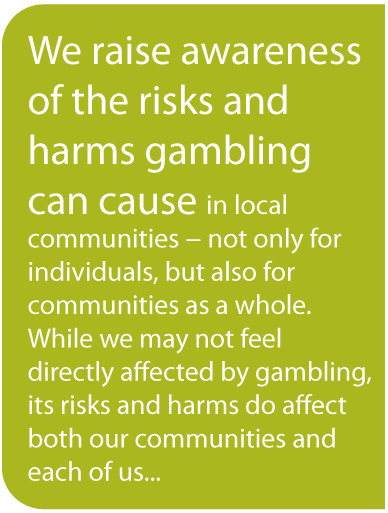 Adolescent males are more at risk for harmful involvement in gambling (Canadian Public Health Association). Gambling advertisements influence youth attitudes, beliefs, knowledge, and intentions with respect to gambling. Youth, New Face of Gambling Addiction, Data Shows – B.C – The 2014 Gambling Prevalence Study shows that gambling has decreased in British Columbia but the younger population is at a higher risk of becoming addicted to gaming. Youth between the ages of 18-24 are most likely to become problem gamblers. Of the youth surveyed 62% participate in gambling and of those 25.7% identify themselves as at risk or problem gamblers. Youth Gambling In Australia – Gambling has become normalized for youth in Australia. – up to 5% of young Australians will develop a gambling problems before they are 25.